If you are wondering about the ‘Sherlock Holmes’ image above, Graham was rather camera shy and used this particular silhouette as his on-line avatar in brewing forums. I will sup these two beers slowly and give a thought for Graham, who inspired so many to brew their own quality beer in defiance of commercial blandness. They are brewed in commemoration of his life and with thanks for the rich brewing knowledge that he shared. Sadly, he left this world to become ‘Supreme Beer Cicerone’ on 30/11/2017. RIP. Remember those small chalk boards that used to hang in some old pubs listing the beers? Well, I found a site that gives you a free digital version. Just a little bit of fun really! 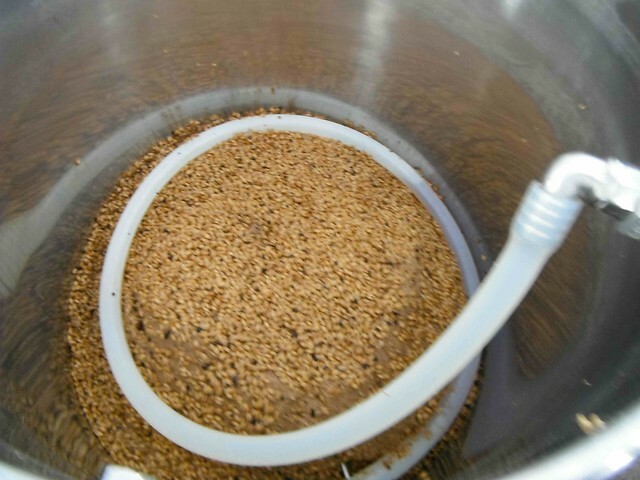 Mash Schedule: Steep, then vorlauf to allow grain bed to form before run off. 60L of Thames Water treated with 55ml of CRS. ph 5.33, alkalinity 21. Sounds good, if not poetic! We shall see what difference it makes when it comes to the drinking. 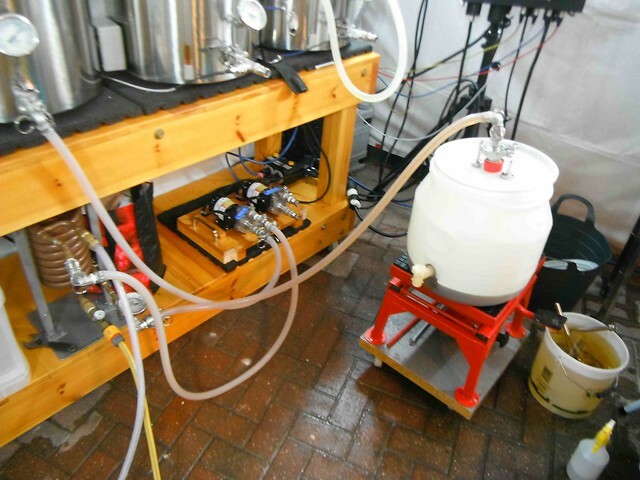 As in all my brews, pure oxygen was pumped into the chilled wort using a wand airstone for 60 secs before pitching. Final collected wort was 32L at an OG of 1.043. 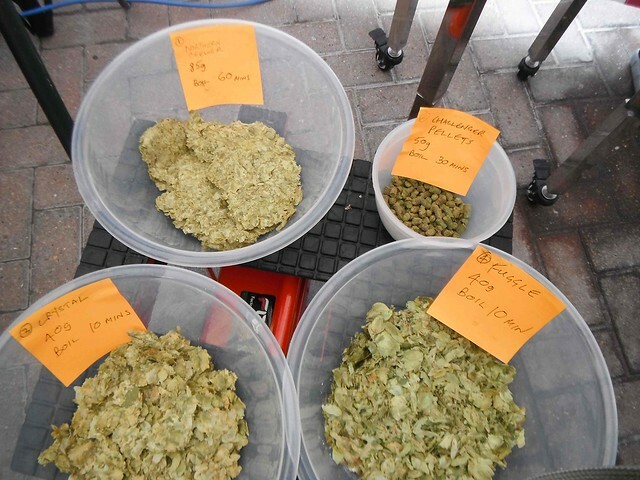 So, now that my first parti-gyle brewing session is all over, what do I think? 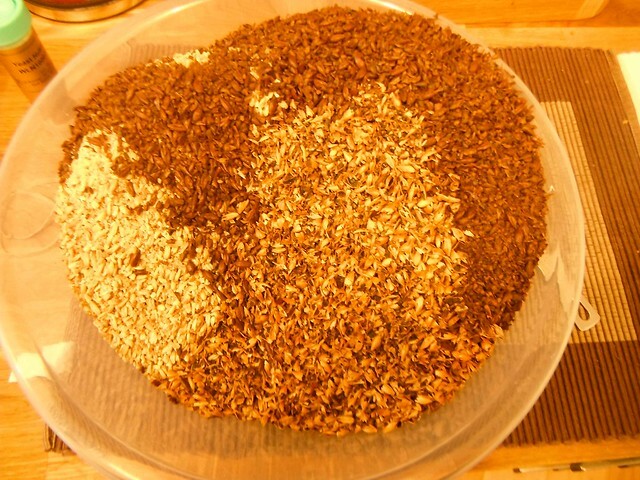 As compared to the standard one-off brew, it can be quite complicated. You have to keep several proverbial balls in the air at the same time, for instance, there are two boil kettles to watch and you need much more treated water. 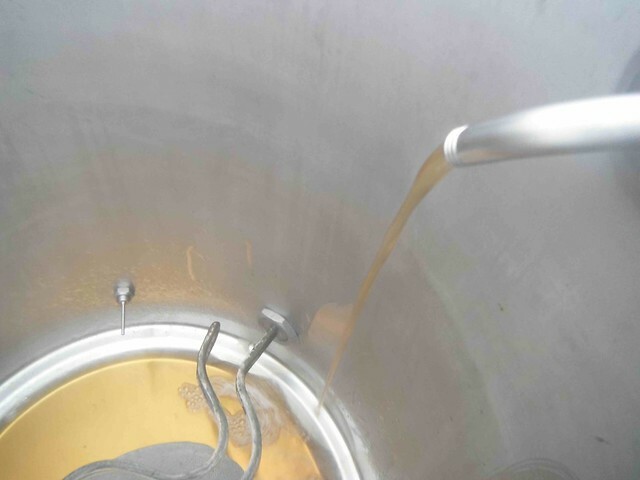 That can involve a double set of water calculations tailored to each brew, as the first and second runnings have a different composition, and not just of sugars. 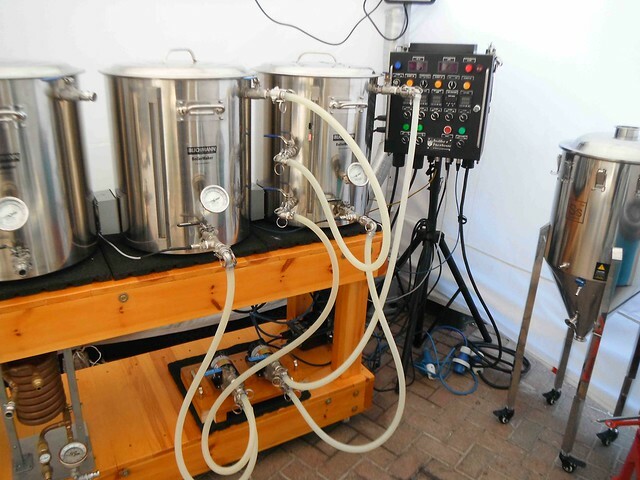 It is also hard to work out, and consequently plug into brewing software, the brewing and mash efficiency for the second brew as you cannot tell with any accuracy the sugars remaining in the ‘spent’ grains. 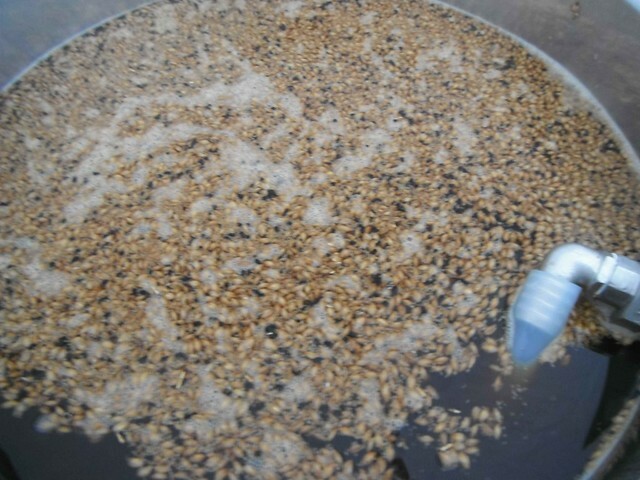 On the plus side, the second brew gyle does not have to be “re-mashed”, as all the conversion has already taken place. This makes it much quicker to do multiple brews. I would never be able to do two full brews in a day with the normal all-grain mash process. The main lesson learnt with my parti-gyle session was in under estimating the potential liquor absorption by the grains. I found that initially the mash tun level for the second brew was about 5L short. 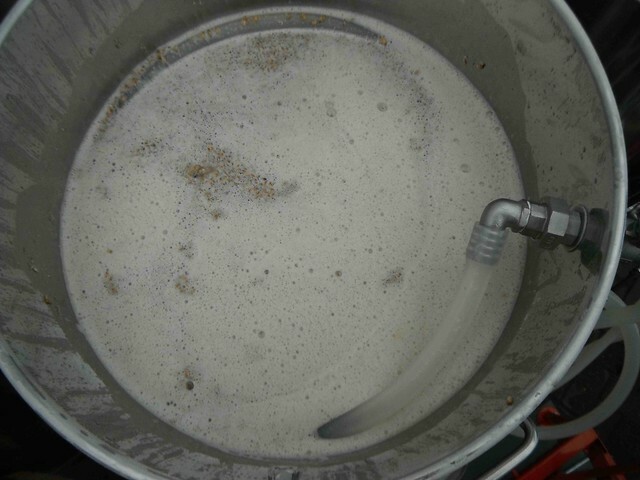 I also miscalculated the temperature drop when I added the hot treated water from the HLT to the second gyle grains. The steeping temperature dropped to 70C instead of 76C, so my steeping and vorlauf extraction may have fell slightly short on gravity points. 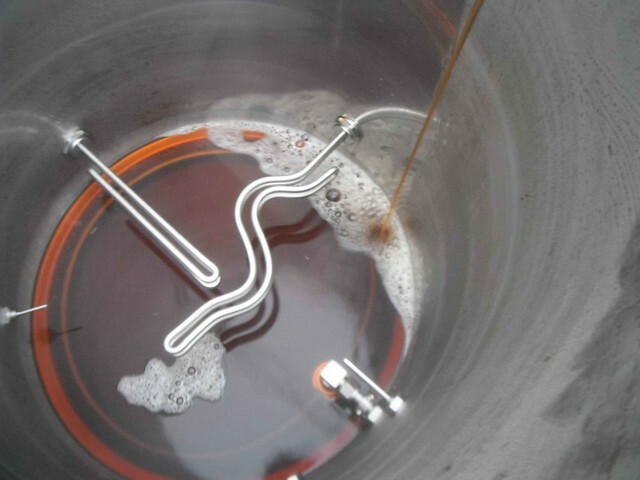 At this point I had used all the water from the HLT in refilling the mash tun, so I could not recirculate the mash liquor through the HLT HERMS coil to heat it up. Having tried the parti-gyle method though, I can say that it was immensely enjoyable and I feel I have earnt another brewer’s stripe to go on my arm. And yes, I would do it again – I am already thinking of a strong Scotch ale and a dark mild parti-gyle. 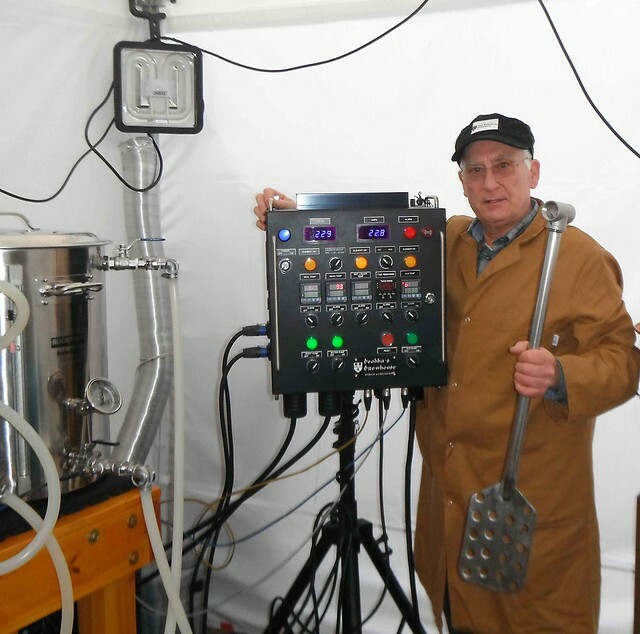 Finally, a picture of the contented brewer, weapon in hand, at the end of a hard day’s work, as taken by SWMBO. 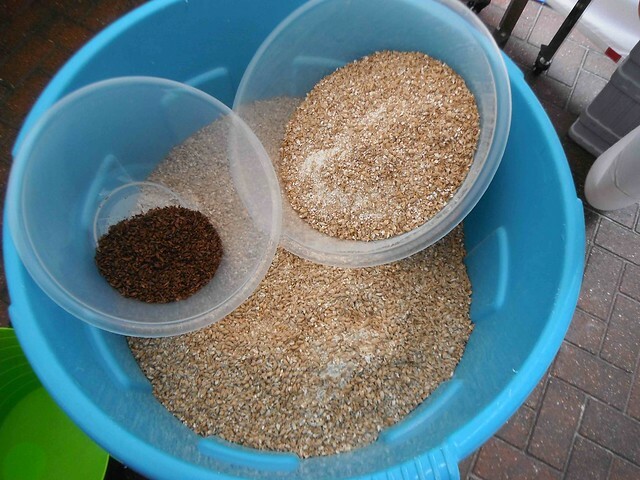 Tomorrow (Friday) and over this weekend I will be trying out for the first time a historical English brewing method in which the same mash is used to produce multiple worts and produce different beers. In my case I will be producing two distinct beers from the same mash and running off the sweet wort into two different brew kettles. 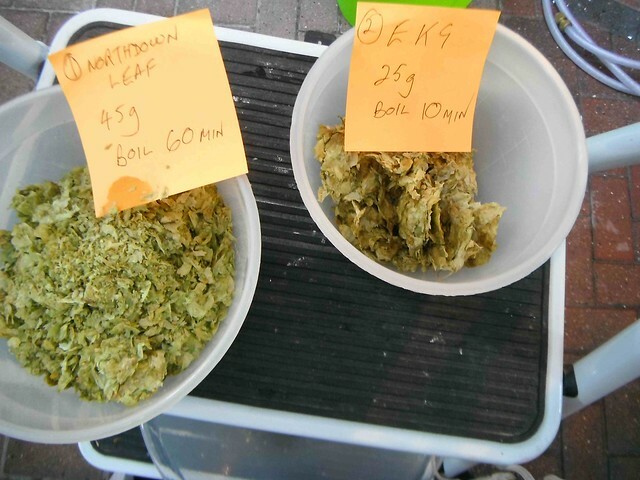 One beer will be an English Barley Wine – hopefully a Thomas Hardy clone at 12% – and the other will be a Norther English Nut Brown Ale at 4.5%. 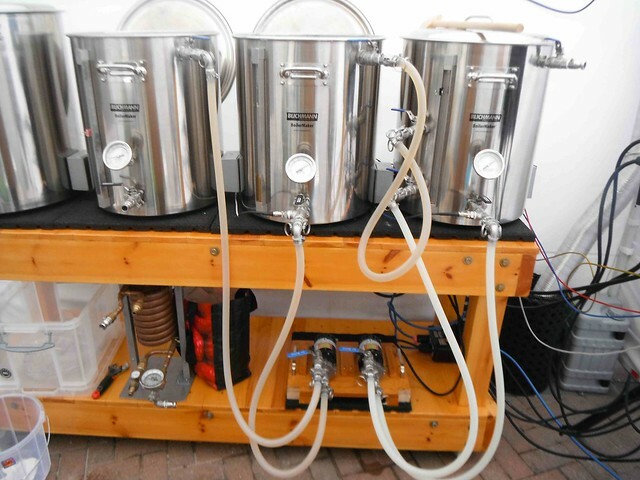 Because a parti-gyle is difficult to do with my 50L Braumeister, I will be getting my 3V system out of mothballs and using that. 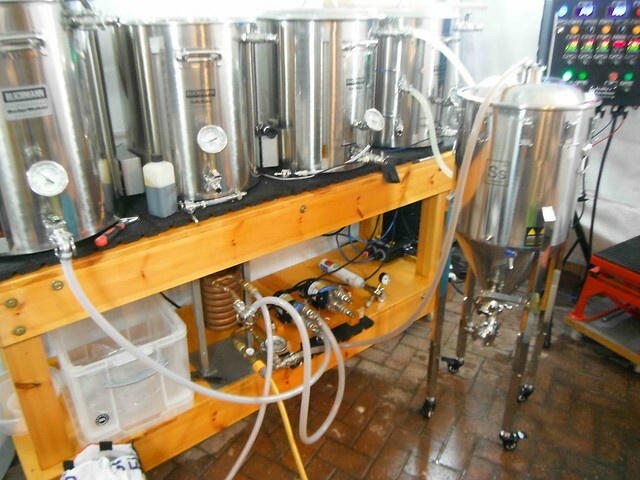 Actually, it will be a 4V as I will be using two boil kettles for the two different beers. I have not used my 3V system for over 18 months, as I have used my BM exclusively over this period, so it will be an interesting experience. In view of the amount of preparation needed, I started to set up the operation today. So just in case anyone might be interested I thought I would post some pictures of the setting up and preparation. I will then follow this up with more pictures of the actual brewing after it has occurred. This also gives me the opportunity to show some greater detail of my 3V-4V system itself and hopefully other Hop members will find it interesting. First picture show the four vessels and the control panel I have built. 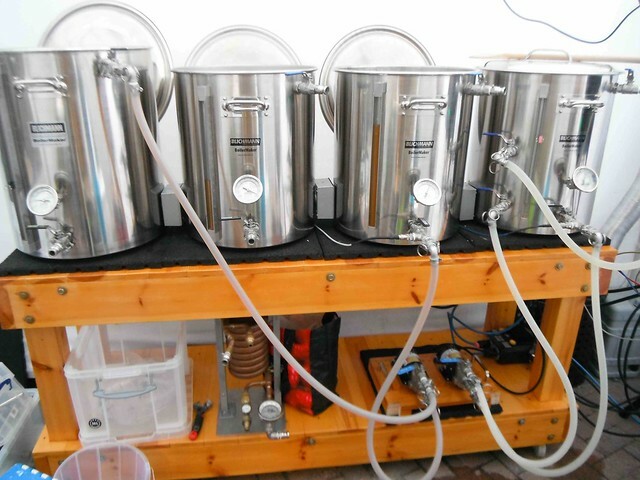 It uses Blichmann pots: 1 x 75L HLT, 1 x 75L mash tun, 1 x 75 boil kettle and 1 x 100L boil kettle. 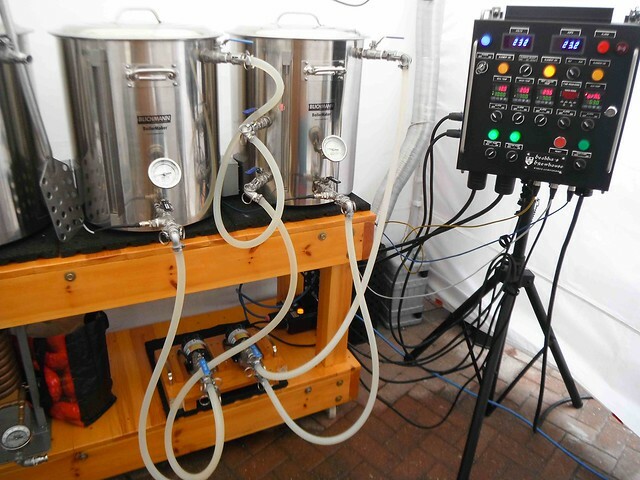 For Clive’s benefit, the picture also shows my SSBrewtech 64L Brewmaster Chronical – fully assembled and cleaned ready for use. 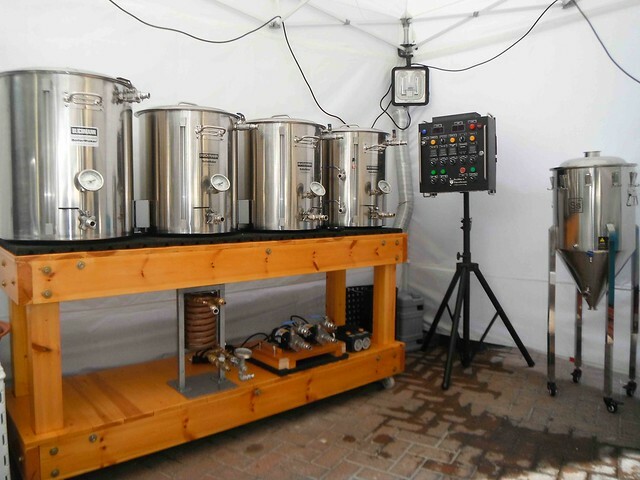 Both boil kettles and the HLT are fitted with two stainless steel elements each. One 5500w and one 2400w. They are independently switchable, giving a range of power from 2400 to 7900 watts per pot. That’s it for now. The brewing starts tomorrow and I will put up the brew pictures as quickly as I can afterwards in the “Brewdays” section.